In this page it is described the development of the course entitled Linux Routers and Community Networks carried out at Mekelle Institue of Technology, Ethiopia, on July 2015. The course was part of a project promoted by the Centre de Cooperació per al Desenvolupament de la UPC and supported by Associació d’Universitaris per a la Cooperació, AUCOOP; Universitat Politènica de Catalunya, UPC; Mekelle University, MU; Mekelle Institute of Technology, MIT and the European Project CONFINE. I moved with 3 students to Mekelle to fulfill the project (Massiel Coves-Garrido, Oriol Lleopart-Esquerdo and Joan Pallarés-Sadó). The aim of the course was to transfer the necessary knowledge so that attendees could manage, expand and create WiFi networks. A production network configured during the course would then be deployed in the Campus by the students that came with me. I prepared material for a course of 30 hours, 6 hours daily for 5 days. 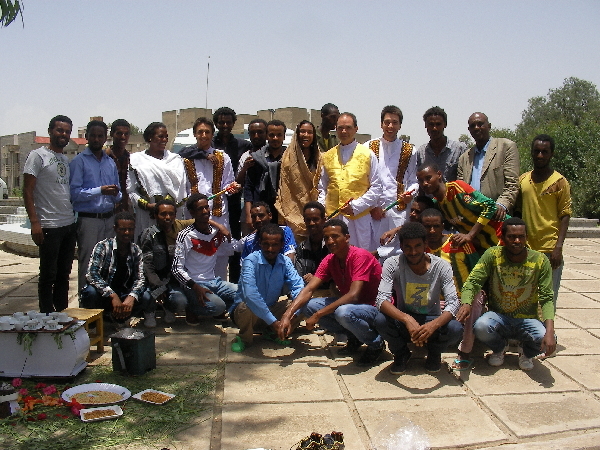 According to the information provided by our contact in Ethiopia a group of 30-50 students with fair background in computer networks would attend the course. I organized the laboratory sessions for 10 groups of students. Each group would configure a TP-Link TL-WDR4300 router. After the course these routers would be used to deploy the internal network. In the last two sessions there would be added four outdoor routers (Nanostations). Then, these routers would be used to interconnect the buildings. The course was attended by students and teachers. The development was a bit different than expected: Some days I estimate that there were about 90 students in the classroom. The background on computer network of the participants was very diverse. Some, especially the teachers, had a solid knowledge on this topic, and could follow the course without problems. On the other hand, there were students that had not taken previous courses on computer networks and had difficulties in following the sessions. My conclusion is that the course objectives were achieved very satisfactorily. Overall, attendees followed the course with great interest. The attendees were especially happy with the practical laboratories. There were teachers that told me that would incorporate some of the material explained in their courses. On Friday we passed a survey to the participants to assess the degree of satisfaction. The responses were very positive. As example, in the following image there is one survey where one comment reads "you are my hero." After the introduction, I started the course explaining session 1: IP Protocol, IPv4 and IPv6 addressing, introduction to linux routers basic commands Linux network administration (files, processes, network configuration). Then the participants built an Ethernet patch cord. Finally we flashed OpenWRT in the TP-links routers. I finished the theory of session 1: VLANs and WiFi configuration and OpenWRT. Then the participants went on to set up the proposed network using static routing. At the end of the day only a small part of the proposed network was configured. I explained session 2: Configuration of CISCO routers, IOS and the linux package "quagga". I explained the RIP routing protocol and the participants configured a network using RIP. Most of the network was configured. The OSPF part of this session was left for lack of time. We skipped the third session, firewalls, for lack of time and went straight to session 4: Community networks, mesh networks, description of Guifi.net, the qMp distribution and the BMX6 mesh protocol. We started the laboratory sessions flashing the routers with the qMp distribution. Then the participants registered in Guifi.net, created a node, and add a device to solicit an IPv4 addresses block to configure the routers. We had troubles getting Guifi.net addresses for all routers. Possibly because we had exhausted the addresses assigned to the area. Since the internal network at MIT uses addresses from the network 10.0.0.0/8, we proceed choosing networks from the block 192.168.0.0/16. Attendees started configuring the network that should be deployed in the campus. In the end, however, we did not get the network to work properly. I reviewed qMp and we continued configuring the network. Only at the end of the day we had a network more o less running. We skipped Session 5 (network management) for lack of time. We took the routers with us to the Hotel to debug the configuration errors. We tested the network again in the Campus correcting some configuration errors. In the end it worked properly and I went to the airport to return to Barcelona. In the following link there is a blog with more information (in Catalan). In the following link there are the pictures I took during the trip.